The reserved Shar Pei and the outgoing Labrador Retriever (Lab) have different personalities, but these two popular dogs come together in the one-of-a-kind Shar Pei Lab mix. Also called a Lab Pei, the Shar Pei and Lab mix is loyal, loving, and protective of its family. Let me tell you what you need to know about this excellent family dog. What is a Shar Pei Lab mix? How big does a Shar Pei Lab mix get? 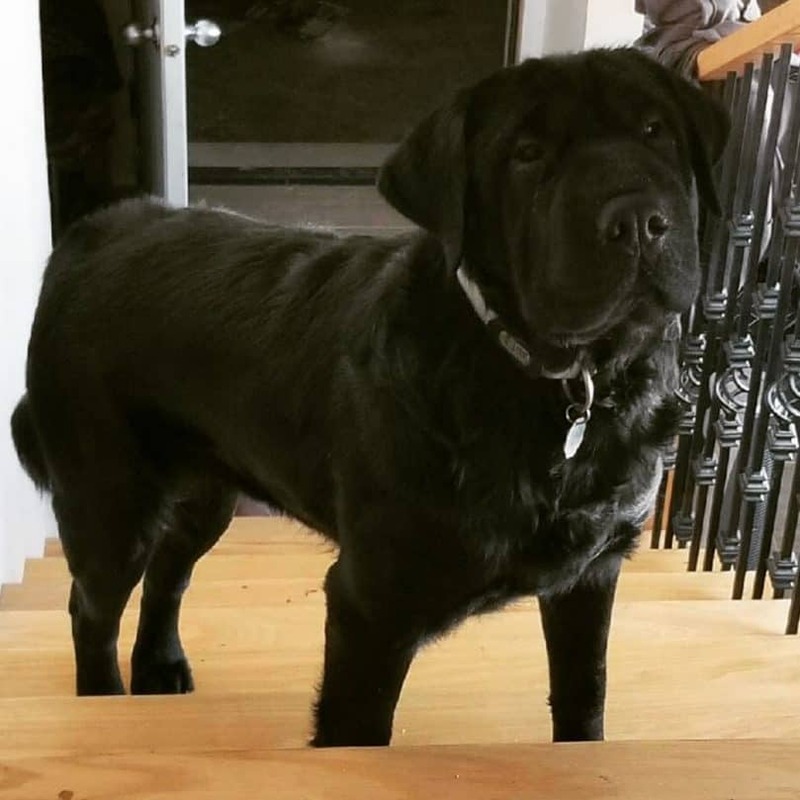 What is the temperament of a Shar Pei Lab mix? Is the Shar Pei Lab mix hypoallergenic? 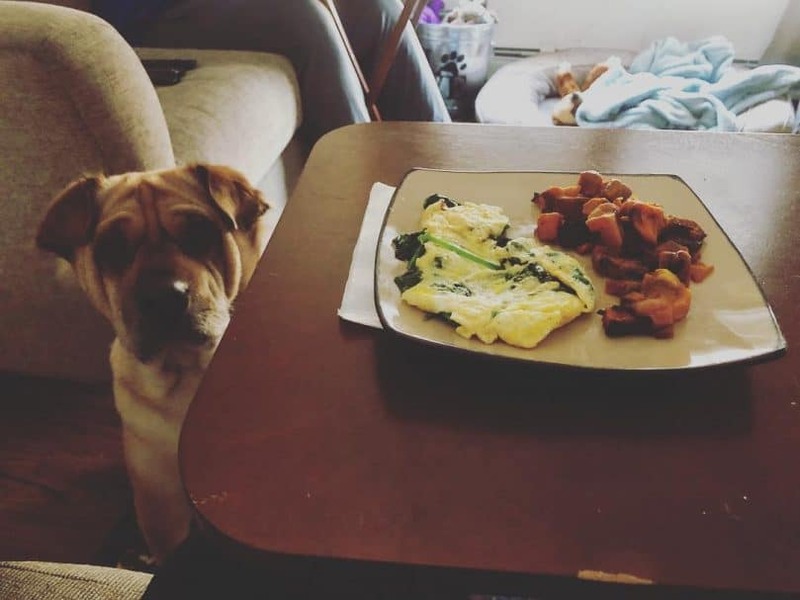 What’s the best diet for a Lab Pei? What health problems do Labrador Shar Pei mix dogs have? Where can I find Shar Pei and Lab Mix puppies for sale? Is the Labrador Sharpei hybrid the right pet for you? A Shar Pei and Lab mix is the first-generation crossbreed of the Chinese Shar Pei and the Lab. This hybrid usually displays a good combination of the Shar Pei’s and Lab’s qualities when it comes to appearance and temperament. Most Labrador Sharpei dogs have almond-shaped eyes and black or dark brown noses. Many of them inherit the loose facial skin of the Shar Pei, but the skin won’t be as wrinkled as the purebred’s. Their small, folded ears are reminiscent of those on the Labrador. These dogs come in a wide variety of coat colors ranging from cream to black. If you’re looking for a chocolate Lab Shar Pei mix or a yellow Lab Shar Pei mix, you have a good chance of finding a dog with the coat color you want. The Shar Pei and Labrador Retriever share a similar stature, so it’s not surprising that the Lab Pei is a large dog as well. A full grown Shar Pei Lab mix stands 18 to 25 inches (45 to 63 cm) tall and can weigh between 55 to 70 pounds (24 to 31 kg). Some breeders may try to pass off a smaller hybrid as a mini Shar Pei Lab mix. These undersized dogs are most likely bred from so-called Miniature Labradors, which are Labs that carry the gene for dwarfism. Regular-sized Shar Pei and Lab hybrids often have a compact, muscular physique. Because of these dogs’ size and strength, it’s best to keep a close eye on them when they’re around kids. Lab Peis could knock down a toddler who’s being too rough during playtime. Shar Pei and Labrador mixes tend to inherit the independent nature of their Shar Pei parent. Though this crossbreed appears to be aloof, it’s a loving and affectionate pet, especially towards its family. These dogs will prefer spending time with you to being alone. Labrador Shar Peis are extremely loyal and protective. They’re naturally suspicious of strangers, a trait that makes them effective guard dogs. However, the protective nature of Lab Peis doesn’t mean that these hybrids are aggressive. They’re more likely to bark at strangers than to attack them. Shar Pei and Lab mixes, like Shar Peis, are also adaptable. They can easily adjust to a variety of living situations and environments. The most important factor in training a Sharpay-Lab cross is asserting your authority as a pack leader. Be firm during training sessions, but make sure you reward good behavior as well. The good news is that the Labrador Sharpei is an intelligent dog that’s eager to please its owners. With consistent training, your Lab and Shar Pei mix will quickly pick up and master commands and non-verbal cues. Early socialization is crucial for the Lab Shar Pei crossbreed, as this dog needs to learn how to properly behave around other pets and younger children in the household. Obedience training may also be needed because this hybrid can inherit the Shar Pei’s willfulness. The Shar Pei and Lab hybrid is a low to moderate shedder, so it probably won’t make you sneeze as much as other breeds. You won’t need to do much to keep the shedding under control either. Brush the Lab Pei’s coat up to 2 times a week to remove loose hairs and maintain the coat’s shine. Brushing the dog’s fur regularly also ensures that natural oils are distributed in its coat. What you need to pay special attention to are the folds on the Shar Pei Lab mix’s skin. Use a damp cloth to clean these folds regularly so you can prevent skin infections and allergies. Given its size, the Shar Pei and Lab crossbreed has a hearty appetite. Feed your Lab Shar Pei 2 to 3 cups of dry dog food daily. This amount of food should be split into 3 or 4 meals a day to prevent bloat, which commonly affects the Labrador and other large dogs. A protein-rich diet ensures that the Sharpay Lab’s muscles, bones, and joints remain strong. Ideally, the kibble should be large in size to keep the Labrador Sharpei from quickly gobbling it down. You can also keep your dog from eating too fast by using a slow feeder bowl. Their large size and healthy appetites make these crossbreeds prone to obesity. Shar Pei Lab mixes tend to put on weight quickly, so try not to go over the recommended daily amount of food for these dogs. Daily exercise also helps in keeping your Shar Pei and Lab crossbreed fit. Most of these dogs have medium energy levels, so they’ll be fine with 60 minutes of physical activity per day. Long walks, runs around the neighborhood, and short hikes are all activities that this hybrid will enjoy. Lab Peis also enjoy active playtime, so they’ll love running around the backyard or playing fetch and tug-of-war with you. A Shar Pei and Lab mix has a life expectancy of 8 to 12 years, but several conditions can affect its health. As in most large dogs, hip and elbow dysplasia is common in this crossbreed. It’s also vulnerable to developing infections and allergies between its skin folds. Histiocytoma, a skin cancer, also commonly affects Shar Peis. This serious skin condition could manifest in the Shar Pei Lab cross as well. Like its Labrador parent, the Lab Shar Pei can be prone to heart conditions, muscular dystrophy, and progressive retinal atrophy. 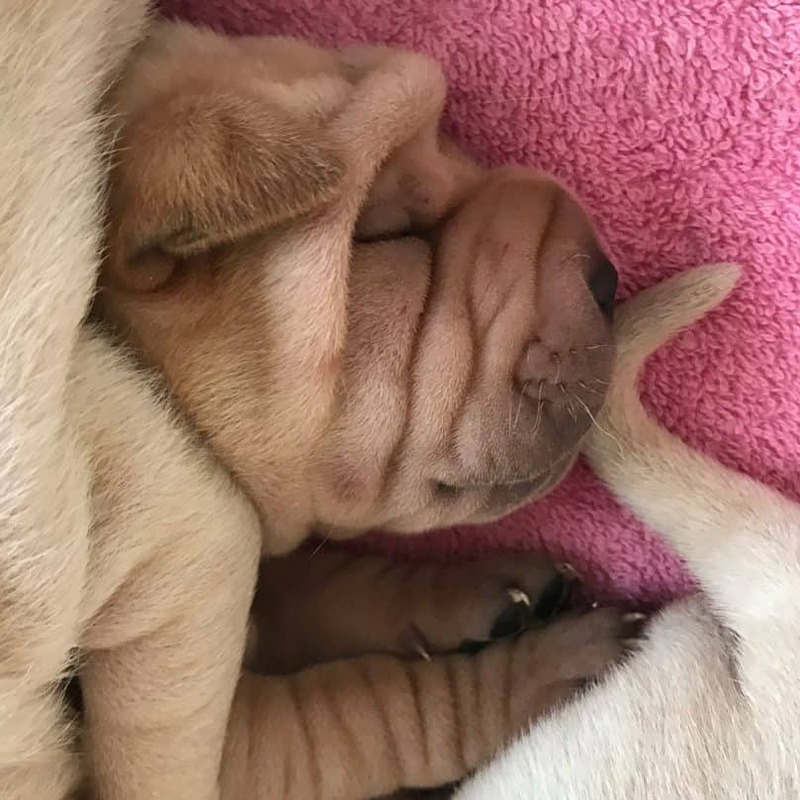 The Shar Pei can also pass down to the Shar Pei and Lab mix a predisposition to respiratory problems, cherry eye, and deflated muzzles. You can also contact local rescue organizations and shelters if they have a Shar Pei Lab mix for adoption. The Lab and Shar Pei mix inherits the best qualities of its parents. Although not as outgoing as the Labrador, this crossbreed is a loving dog that’s protective of its family. However, the Lab Pei can require meticulous care, especially in cleaning the folds and wrinkles in its skin. Due to this dog’s size and strength, you’ll also have to supervise playtime with toddlers and small kids. What do you think of the Shar Pei Lab mix? Let us hear about your thoughts in the comments!